Spring has sprung! Errr, I mean spring has kinda sprung? It’s still pretty darn cold here in North Carolina BUT is finally supposed to warm up later this week. YES! YES! So in celebration of the start of the season, it’s time to chat about this oh-so-pretty green veggie farro fried rice! Because it’s lean, mean and gorgeously green! And packed to the brim with the good stuff, I might add. We have crisp bell pepper, zucchini, bok choy! Some red onion, garlic and ginger for tons of flavor. Sweet green peas, yummy scrambled eggs, crunchy creamy cashews, salty tamari! And of course, one of my favorite whole grains … farro! The gang’s all here. Getting groovy together in a big skillet and just waiting to be enjoyed for an easy and healthy dinner. Now, I’m sure many of you have heard me wax on all poetic about my love for farro but um, here we go again. It’s nutty in flavor, perfectly chewy in texture and makes for a super fun sub for regular ol’ rice in fried rice! <— Fried farro? Ah, you know what I mean. AND! Since we need to use cold farro in this recipe (i.e. we cook it in advance – say perhaps when you have time on the weekend? ), the dish comes together nice and quick at right around 30 minutes. Weeknight meal anyone? Stir-fried farro, you the best! Now, I have tried a number of different brands of farro over the years (umm due to my mild obsession with the grain), and yet I always find myself coming back to Bob’s Red Mill Organic Farro. It cooks perfectly each and every time and the texture is spot on. No weirdness, no fuss. Just wholesome, high quality goodness that results in the best possible final product. <— And I mean business when I talk about homemade fried rice farro! First things first. I know it can be a pain to use cold farro, but please do! It’s key for both texture and that “fried” rice taste. So plan ahead and cook your farro in advance. I love to do this on the weekend so it’s ready to go for a super quick meal during the week. Also key! Once we add the cold farro to the skillet, we cook it for about 3 to 4 minutes, tossing and stirring occasionally. This process helps to develop that fried and toast-y flavor – so don’t rush or skip this step. I’ve listed a range for the soy sauce / tamari down in the recipe. I’d suggest starting with the lower amount and then adding more to taste. Remember you can always drizzle in more but can’t take it out! For my vegan friends and those with egg allergies – just leave out the eggs! It’s still completely delicious. And finally, this is also fantastic bulked up / topped with a protein of choice. Use whatever floats your boat – chicken, pork, tofu! Plenty of options! So … are you looking for more spring recipe goodness? This spring vegetable lo mein and these spinach chickpea falafel with lemon yogurt sauce are reader favorites! This green veggie farro fried rice makes for a quick and easy weeknight dinner! With chewy farro, bok choy, zucchini and cashews! 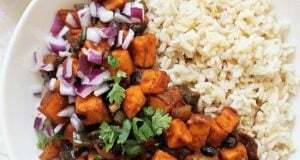 Healthy and simple! Add 2 tablespoons of the olive oil to a large nonstick skillet set over medium heat. When hot, add in the red onion and cook for about 2 to 3 minutes, until it starts to soften. Add in the bell pepper, zucchini and bok choy stems. Cook for about 5 minutes, until everything has started to soften. Add in the bok choy leaves, the frozen peas, garlic and ginger. Continue to cook for about 2 to 3 minutes, until the veggies are all tender. Remove the mixture to a medium bowl. If the skillet is dry, add in ½ tablespoon more oil and give it a swirl. Add in the eggs and cook, stirring frequently, until scrambled. Remove to the bowl with the veggies. Add the remaining 1 tablespoon olive oil to the skillet, then add the cold farro. Cook for about 3 to 4 minutes, breaking up any clumps with a wooden spoon and stirring occasionally, until heated through and toasted. Turn down the heat to medium low, then add in the veggie/egg mixture, the cashews and the soy sauce. Continue to cook for about 1 minute, stirring frequently, until everything is nice and hot. Serve as desired! *Cook 1 ½ cups dry farro according to package directions. It will give you this amount! This looks absolutely stunning, Ashley! This is my idea of the perfect spring / summer food! I so envy that you’re having cold weather! It’s absolutely boiling here! All the best ingredients, I need to start cooking with bok choy more! Hopefully you are warming up a bit, here in CA we’ve had 96F uggggh I hate it lol!! Gaaaawd this looks so fresh and tasty! I’d definitely eat this for dinner on repeat! Another amazing dish Ashley, this one looks so fresh and healthy. A bowl of Spring to be sure! You are the queen of awesome stir-fry types of dishes! As usual with your recipes, I’d eat this in a heart beat. 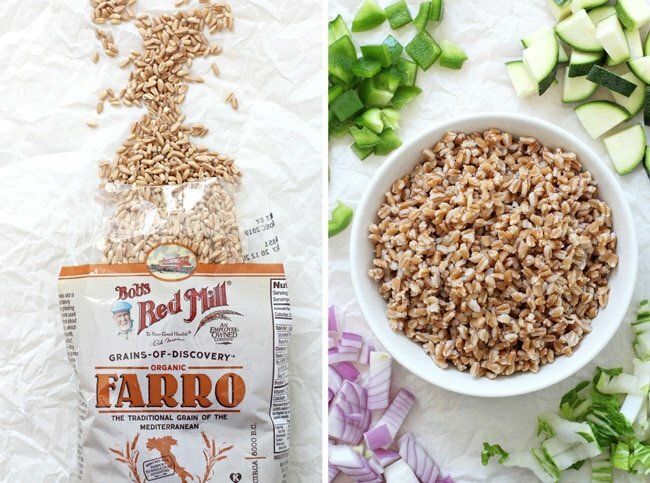 Farro has been one of my favorite types of grains lately… It’s so hearty & yummy! Mmm what a pretty fried rice! I love all of the fresh veggies in here. So perfect for this spring-ish weather! As for this fried rice, I love that you made a green version for spring and included farro which is much more nutritious than standard white rice. Such a perfect quick and easy meal for spring! Thank you so much friend 🙂 I really appreciate it! Farro fried rice is my favorite fried rice…that’s not really rice! I love all the gorgeous green veggies in here and this is something I’d love to eat for lunch every day! A wholesome side dish! I love what you eat…always healthy, versatile and delicious!